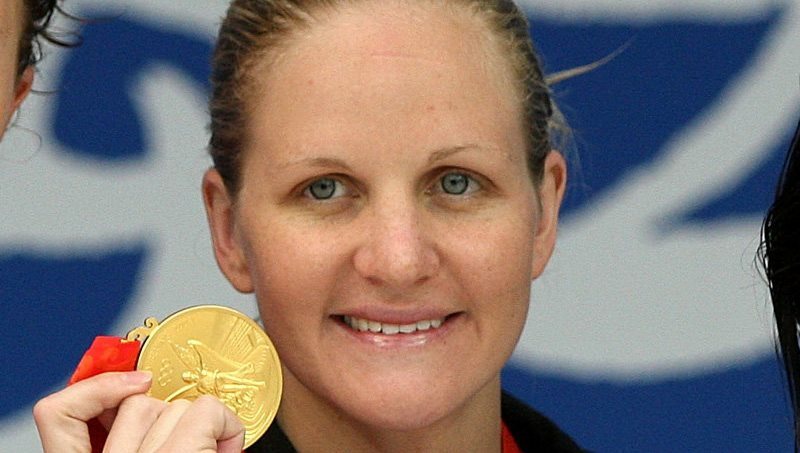 Kirsty Leigh Coventry (born 16 September 1983 in Harare, Zimbabwe) is a Zimbabwean swimmer and former world record holder. She attended and swam competitively for Auburn University in Alabama, in the United States. At the 2004 Summer Olympics, in Athens, Greece, Coventry won three Olympic medals: a gold, a silver, and a bronze, while in the 2008 Summer Olympics in Beijing she won four medals: a gold and three silver. She was subsequently described by Paul Chingoka, head of the Zimbabwe Olympic Committee, as “our national treasure”. Zimbabwean President Robert Mugabe has called her “a golden girl,” and awarded her US$100,000 in cash for her 2008 Olympic performance. Coventry attended Dominican Convent High School, Harare in Zimbabwe. 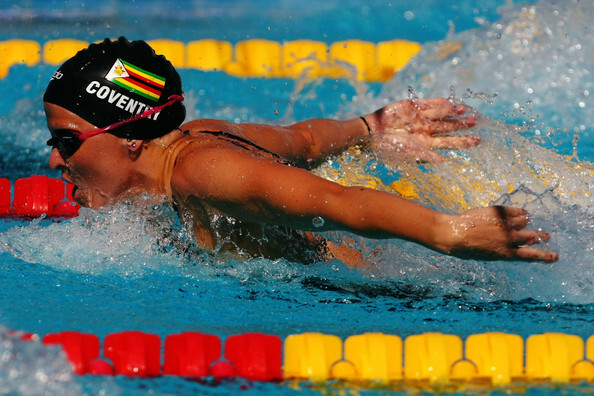 In 2000, while still in high school, Coventry became the first Zimbabwean swimmer to reach the semifinals at the Olympics and was named Zimbabwe’s Sports Woman of the Year.As a student at Auburn University, Coventry helped lead the Tigers to NCAA Championships in 2003 and 2004. In 2005, she was the top individual scorer at the NCAA Championships and captured three individual titles including the 200 m and 400 m individual medley (IM), and the 200 m backstroke for the second consecutive season. She was named the College Swimming Coaches Association Swimmer of the Meet for her efforts. Other awards include 2005 SEC Swimmer of the Year, the 2004–2005 SEC Female Athlete of the Year, and the 2005 Honda Award Winner for Swimming. In Melbourne at the 2007 World Championships, Coventry won silver medals in the 200 m backstroke and 200 m IM. She was disqualified in the 400 m IM when finishing second to eventual winner Katie Hoff in her heat. Coventry finished in a disappointing 14th place in the 100 m backstroke in a time of 1:01.73, failing to qualify for the finals. Coventry continued her good form of 2007 by winning four gold medals at the International Swim Meet in Narashino, Japan. She led the way in the 200 m and 400 m IM as well as the 100 m and 200 m backstroke. In 2008, Coventry broke her first world record in the 200 m backstroke at the Missouri Grand Prix. She bettered the mark set by Krisztina Egerszegi in August 1991, the second oldest swimming world record. Her new record was 2:06:39. Coventry continued her winning streak at the meet by winning the 100 m backstroke and the 200 m IM. Coventry is the third woman in history to break the 1:00 minute barrier in the 100 m backstroke, and the second to break the 59-second barrier. 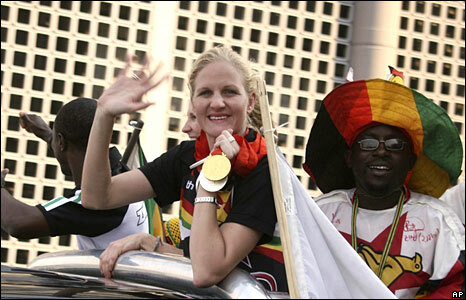 Coventry represented Zimbabwe at the 2008 Summer Olympics in Beijing. Coventry won the silver medal in the 400 m individual medley on 10 August 2008, becoming the second woman to swim the medley in less than 4:30, the first being Stephanie Rice who won the gold in the same event. Coventry beat the world record by just under two seconds, and was only just beaten by Rice to a new WR. Coventry, in the second semi-final of the 100 m Backstroke, set a new World Record of 58.77 seconds. However, in the final of that event she was beaten to the gold medal by Natalie Coughlin. Coventry was again beaten by Stephanie Rice in the 200 m individual medley, despite swimming under the old world record. Coventry did defend her Olympic title in the 200 m backstroke, winning gold in a world record time of 2:05.24. Awarded US$100,000 by President Mugabe for her success at the Olympics, Coventry gave a portion of that money to charity. On 28 November 2008, Coventry’s short course 400 IM World Record was broken by American Julia Smit. At the 2012 Olympics in London, Coventry finished third in her semifinal heat of the 200m individual medley, just edging her into the final, where she placed 6th with a time of 2:11.13. In Semifinal 2 of the 200m backstroke, she placed second, advancing her to the final in that event, where she placed 6th in a time of 2:08.18. In 2012 she was elected to the IOC Athletes’ Commission. She will serve as an IOC member for eight years.